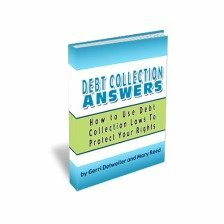 Debt Collection Answers: How to Use Debt Collection Laws to Protect Your Rights! Dealing with debt collectors? So are millions of others. In fact, anyone can find themselves getting these calls. Even if you don’t owe anything you could be getting calls from debt collectors for someone else, or you debt collection scammers could be calling! Learn more and purchase Debt Collection Answers here. I drive around town and see bankruptcy attorneys advertise "lose your debt, keep your stuff" I have a photo of this billboard ad from a local attorney. What disturbs me is that all collection agencies get lumped into the scum of the earth bucket. Yet most are attempting to collect on legit debts owed to creditors.